Washington junior Halli Wall (right) shoots over Hillsboro junior Josie Hopkins during a Frontier Athletic Conference game at Hillsboro High School Monday, Jan. 14, 2019. Also pictured for Washington is junior Shawna Conger. 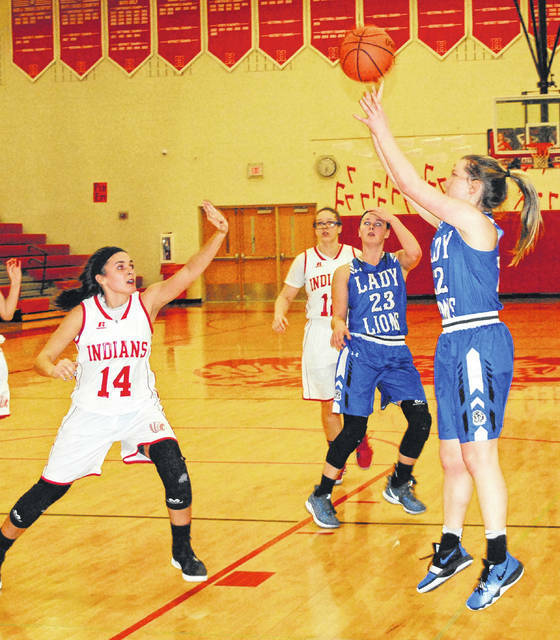 HILLSBORO — Hillsboro’s Lady Indians hosted the Washington Lady Blue Lions on Monday, Jan. 14 in a game that was originally scheduled for Saturday but was delayed by winter weather and poor road conditions in both Fayette and Highland counties. Both teams showed signs of a layoff as the Lady Indians pushed Washington further than expected in a 46-33 loss. Washington opened the game with an 11-0 run that stretched until the 1:48 mark of the first quarter that was capped by a three-pointer by Hannah Haithcock. Despite the opening run it was clear that the Lady Blue Lions were feeling the extra time off as they committed several uncharacteristic turnovers that limited the team’s fast break points. Kayden Watson recorded the first basket of the game for Hillsboro at the 1:48 mark of the first quarter and Lana Grover added a three-pointer a short time later to bring the score to 11-5. Washington opened the second quarter with a 6-0 run over the first two minutes to take a 20-5 lead and force the Lady Indians to call timeout with 6:05 to play in the first half. In other games played Monday, Miami Trace defeated Minford, 54-45 and Waverly beat Jackson, 53-26. HILLSBORO — Gracie Dean 1-0-2; Watson 2(1)-0-7; Josie Hopkins 1(1)-3-8; Lana Grover 1(1)-0-5; Karleigh Hopkins 1(1)-2-7; Jordan Moberly 2-0-4. TOTALS — 8 (4)-5-33. Free throw shooting: 5 of 8 for 63 percent. Three-point field goals: Watson, J. Hopkins, Grover, K. Hopkins. WASHINGTON — Rayana Burns 5-1-11; Bre Taylor 2-0-4; Halli Wall 1-0-2; Shawna Conger 2 (1) 3-10; Hannah Haithcock 6-9-15; Aaralyne Estep 2-0-4. TOTALS — 15 (1)-13-46. Free throw shooting: 13 of 19 for 68 percent. Three-point field goals: Conger.